14 recognized for taxable temporary differences. Temporary differences are the differences between the reported amounts of assets and liabilities and their tax basis. Deferred tax assets are reduced by a valuation allowance when, in the opinion of management, it is more likely than not that some portion or all of the deferred tax assets will not be realized. Deferred tax assets and liabilities are adjusted for the effects of changes in tax laws and rates on the date of enactment. The Tax Cut and Jobs Act of 2017 (the "Tax Reform Act") was enacted December 22, 2017. This legislation makes significant changes in U.S. tax law including a reduction in the corporate tax rates, changes to net operating loss carryforwards and carrybacks and a repeal of the corporate alternative minimum tax. The legislation reduced the U.S. corporate tax rate from the current rate of 34% and 35% to 21%. As a result of the enacted law, the Company was required to revalue deferred tax assets and liabilities at the newly enacted rate. This revaluation resulted in a benefit of $115,000 to income tax expense in continuing operations and a corresponding reduction in the deferred tax liability. The other provisions of the Tax Reform Act did not have a material impact on the 2017 consolidated financial statements. Results of Operations Year Ended December 31, 2017 Compared to Year Ended December 31, 2016 Sales. Sales decreased 1.9% in 2017 to $17.2 million, compared to $17.6 million in 2016. A more competitive market for artwork film sales along with overall soft market conditions resulted in a decrease in Domestic sales from $7.4 million in 2016 to $6.9 million in 2017. Compared to 2016, IKONICS Imaging sales decreased by $231,000 to $4.0 million in 2017 as sales were negatively affected by some customers moving to competing technologies. The IKONICS Imaging sales variance was also impacted by a large initial order from a new customer received in 2016. Partially offsetting these sales decreases in 2017, IKONICS Imaging realized sales of $258,000 for its newly introduced SubTHAT!™ film. AMS sales decreased by $296,000, or 28.4%, in 2017 versus 2016 due to the temporary decrease in orders from AMS's largest customer during the second quarter of 2017. Beginning in the third quarter of 2017, the customer resumed its normal order pattern, which is expected to continue in 2018. 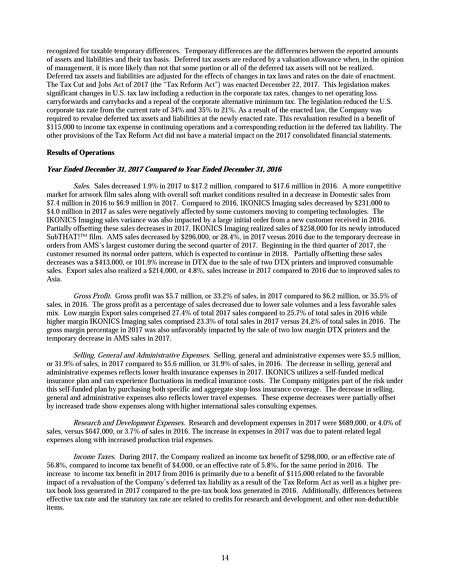 Partially offsetting these sales decreases was a $413,000, or 101.9% increase in DTX due to the sale of two DTX printers and improved consumable sales. Export sales also realized a $214,000, or 4.8%, sales increase in 2017 compared to 2016 due to improved sales to Asia. Gross Profit. Gross profit was $5.7 million, or 33.2% of sales, in 2017 compared to $6.2 million, or 35.5% of sales, in 2016. The gross profit as a percentage of sales decreased due to lower sale volumes and a less favorable sales mix. Low margin Export sales comprised 27.4% of total 2017 sales compared to 25.7% of total sales in 2016 while higher margin IKONICS Imaging sales comprised 23.3% of total sales in 2017 versus 24.2% of total sales in 2016. The gross margin percentage in 2017 was also unfavorably impacted by the sale of two low margin DTX printers and the temporary decrease in AMS sales in 2017. Selling, General and Administrative Expenses. Selling, general and administrative expenses were $5.5 million, or 31.9% of sales, in 2017 compared to $5.6 million, or 31.9% of sales, in 2016. The decrease in selling, general and administrative expenses reflects lower health insurance expenses in 2017. IKONICS utilizes a self-funded medical insurance plan and can experience fluctuations in medical insurance costs. The Company mitigates part of the risk under this self-funded plan by purchasing both specific and aggregate stop-loss insurance coverage. The decrease in selling, general and administrative expenses also reflects lower travel expenses. These expense decreases were partially offset by increased trade show expenses along with higher international sales consulting expenses. Research and Development Expenses. Research and development expenses in 2017 were $689,000, or 4.0% of sales, versus $647,000, or 3.7% of sales in 2016. The increase in expenses in 2017 was due to patent-related legal expenses along with increased production trial expenses. Income Taxes. 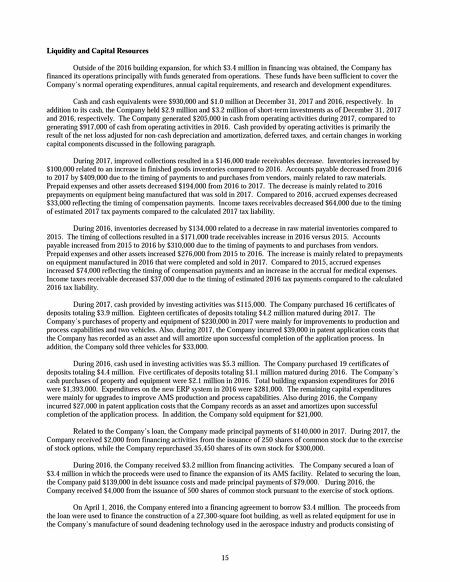 During 2017, the Company realized an income tax benefit of $298,000, or an effective rate of 56.8%, compared to income tax benefit of $4,000, or an effective rate of 5.8%, for the same period in 2016. The increase to income tax benefit in 2017 from 2016 is primarily due to a benefit of $115,000 related to the favorable impact of a revaluation of the Company's deferred tax liability as a result of the Tax Reform Act as well as a higher pre- tax book loss generated in 2017 compared to the pre-tax book loss generated in 2016. Additionally, differences between effective tax rate and the statutory tax rate are related to credits for research and development, and other non-deductible items.